The main objective of an emergency preparedness and prevention program for chemical or radiological emergencies is to prevent or mitigate effects on human health. A multidisciplinary health plan to address these risks will involve the companies and institutions that produce, market, transport, and use products for industrial and medical purposes. A good up-to-date database should be maintained, and preventive, preparedness, and response plans should be coordinated with these firms and institutions as well as with civil defense institutions, fire departments, and other actors. 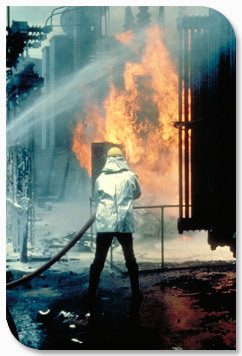 Click here for more information on preparedness for chemical emergencies. Hazardous substances are classified in several categories, depending on the ways in which the population is exposed to them. Their harmful effects on health vary greatly. A wide range of information on hazardous substances, including substance identification support, physical characteristics, human health information, and containment and suppression advice is available from the WISER website (WISER is a system designed to assist first responders in hazardous material incidents. Considering that countries should always be prepared for the worst possible scenario, health preparedness plans must consider the need for trained staff, appropriate medical equipment, decontamination equipment, transportation equipment, personal protection equipment, and a specialized facility with a sufficient stock of up-to-date antidotes and other pharmaceutical products that will help identify places suitable for conducting decontamination and treatment, and prepare them for the process. It is also of paramount importance to incorporate chemical and radiological emergency care in hospital preparedness plans. For more information, visit the website Chemical Hazards Emergency Medical Management (CHEMM). Identification of the substances involved and the victims' symptomatology. Number and type of patients and their degree of exposure. Needs for personal protection in providing patient care. Eliminate toxic substances from the organism. Provide therapy for symptoms and support. Administer specific therapy with antidotes. Intensify the elimination of toxic substance. In both chemical and radiological emergencies, it is important that plans include provisions for informing the public, as well as mechanisms to provide psychological support for the anxiety that these emergencies cause in the general public. For information on what to do before, during, and after a radiological emergency, consult Radiation Emergency Medical Management (REMM). Preparedness also requires mechanisms for monitoring and investigation after the acute stage of a chemical or radiological emergency to prevent secondary consequences in humans and the environment. To better understand chemical and radiological agents and scope of the public health response required, consult the publication Response to Biological and Chemical Weapons: WHO Guidance.